1) Remember to get Xcode Command Line Tools installed, using the Install button next to the Preferences > Downloads > Components > Command Line Tools option. An awesome tutorial video to getting stated PhoneGap 2.0. But, when in try to debug by ios-sim. I got an “error: /VERSION: No such file or directory” error. 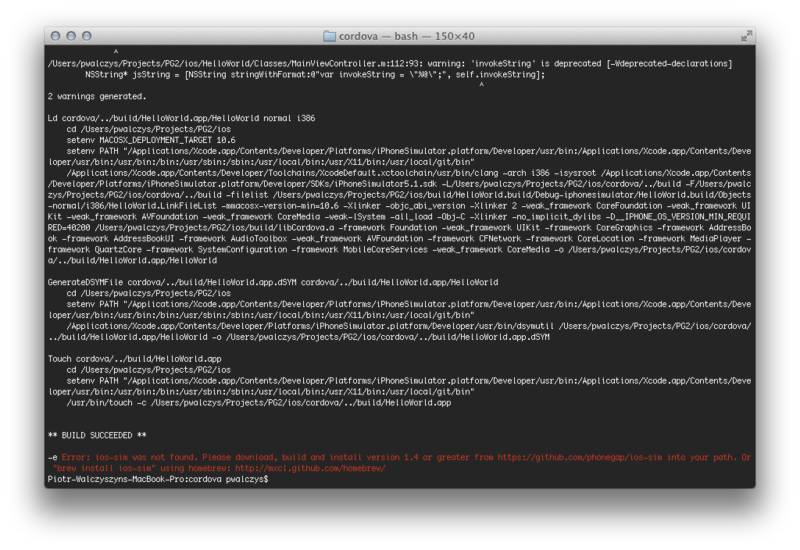 Someone got some error message when they build project on Xcode (http://goo.gl/eF9F5), but i am doing OK on Xcode. Could you do my a favor? Which step was wrong. Thanks a lot. It looks to me like it can’t find installed Cordova library/project which should be in your users Documents directory and named something like CordovaLib. Looking forward to the Cordova/PhoneGap 2.x PhpStorm configuration tutorial. I have just installed phone gap 2.0 and created a new project. I replaced all of the www files with my own project from dreamweaver. I opened the project in Xcode and ran it in the simulator. It works fine, except that the icons and splash screen are cordova images, not the images from my project. I have removed every instance of cordova icons and splash screens from the Xcode project and replaced them with my own images, but still the cordova icons and splash screens persist when I open the simulator. How do I get rid of the cordova icons and splash images? But I’ve got a problem trying to build it with command line: it says that build succeeded without error but doesn’t launch ios simulator. I’m on MacOSX Lion, XCode 4.4 and ios-sim 1.5 . Does the ‘Marius’ folder exist? If not, create it and try again. This was the problem I had, and creating the folder first fixed it. This is what I get when trying to start a new project…Please Help…..
@lalsomde from what you posted I see you are using – sign instead of ~ sign in the path. Thanks a lot for this is very simple clear tutorial. And nothing is created at the folder itself. DO you know why does this happen ? Do you think something should be removed to fix this problem ? 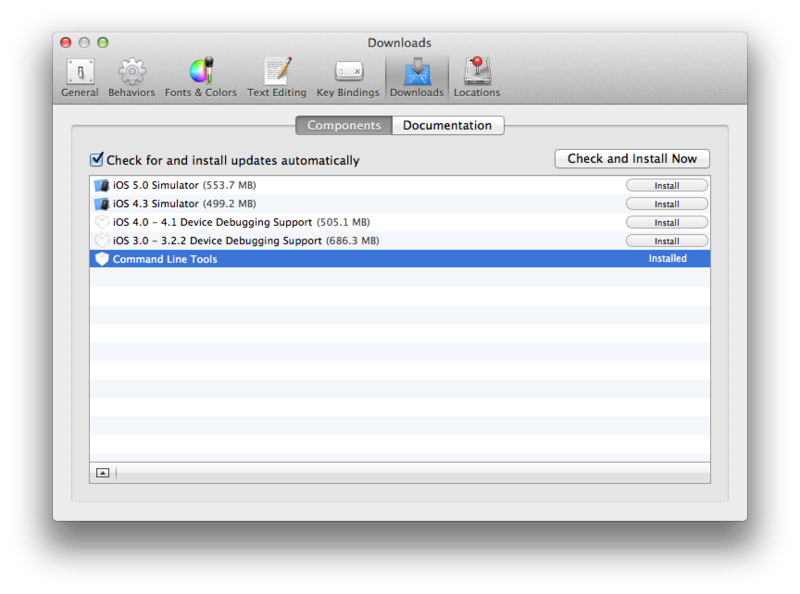 I run Xcode 4.4.1 on OS X Mountain Lion (10.8.1). 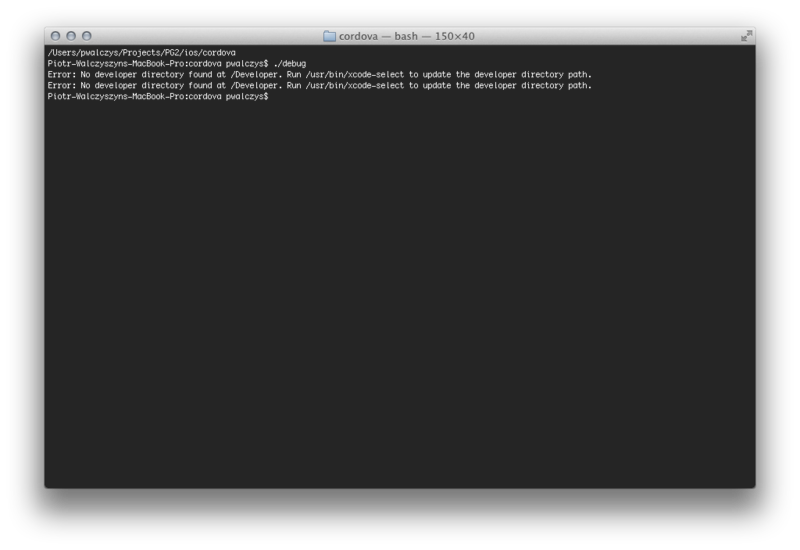 I have command line tools installed in Xcode. on runtime appears debug messages, by example if you enable location plugin, automatically the app request user location authorization yet i dont have code with getCurrentLocation calls. How can i disable this messages, or calling to geolocation. I wish authorization request appears when my code call it, not automatically. or a good starter video tutorial . But… of course I have a question. First of all I want to say its a great tutorial. The iOS version works for me but when I try to do the android I get this message. Make sure you have Android SDK platform and platform-tools directories in your PATH, it is not enough to have it just installed. Thanks Piotr for the reply. This is what I noticed after I did what you recommended. Then Check where your android Sdk is located …. I followed the instructions carefully. At first I got an error indicating the CordovaLib.xcodeproj not found. It was in /users/hsmith825/Development/CordovaLib as it should be and the source tree entry in Xcode preferences was set correctly. Finally, I moved all my files and Cordova CordovaLib to trash and remove the sourcetree entry in preferences. I reinstalled Cordova 2.0.0. Now the install does not reinstall the CordovaLib. I have spend many hours trying to get the startup to work. I have no idea what to do. I got an error when I wants to start the app in emulator in Xcode. I also tried this through ios-sim, but also fails. Do you know whats the problem is and can you help me out? Ok. The reason this was happening appears to be a space in the resolved (actual) pathname due to space in the username. The home directory name has a space if the username has a space. Renaming the user and home directory so there is no space appears to fix this problem. I have one question. I have installed command line tools, but I can’t find button( >_< ) by Search box on toolbar. How can I see this button? What is this button's name? I’m trying the new phonegap version. Finally I could create the project with the command line on Terminal. But when I Run the app to an initial test, in the Scheme appears __TESTING__ (My Mac 64-bit) or CordovaLib with iOS device, iPad and IPhone simulator, but no works. The question is, why my project name not appears on the scheme list? Hallo, Im new with Xcode and Cordova (PhoneGap) I don’t know what I’m doing wrong… i have Xcode, and everything and i downloaded Cordova. first there was no installation .dmg so i downloaded 2.0 with .pkg included, i installed it.. than i should have the option in iOS Application to make new Cordova application, right? what am i doing wrong and how can i make a Cordova application in Xcode? it is so hard to find good Tutorial about it! I haven’t heard of ios sim before this tutorial of yours. It’s quite a handy tool. Thanks. I got my first Phonegap (android) working. I’m using version 2.5. I don’t need to run ./debug command. Thanks for a great tutorial!